Angry Birds is one of the most popular games ever developed for the iOS platform. However, its gameplay mechanics are not original and are inspired by Crush the Castle – an online physics-based artillery game. Still, Angry Birds attracts more eyeballs because of its easy controls, good graphics and a rather funny and unusual concept. There are many games like Angry Birds with plot and gameplay as interesting and addictive as the original. Here are the top 5 iOS games with a familiar "catapult to launch objects" type of gameplay. If you thought Angry Birds has an unusual plot, think again, because there’s an Angry Birds clone with a storyline as crazy as the original. In Crazy Penguin Catapult, a bunch of evil polar bears have imprisoned poor little penguins. Your objective is to help a group of eccentric commando penguins to vanquish them. You will have to catapult crazy penguins and destroy the icy hideaway of the evil polar bears to save the imprisoned buddies. The gameplay is very similar to the original, including the familiar catapult that needs to be pulled back and released to launch penguins. Crazy Penguin Catapult 2 has 50 challenging levels, but the game is quite short and lacks the depth and polish of Rovio’s masterpiece. Still, it is a good Angry Birds alternative. As much as this physics-based puzzle game’s funny title competes with Angry Birds, the war between unworthy candidates is as bizarre as simple green pigs and wingless chirpy birds. Pirates Vs Ninjas Vs Zombies Vs Pandas, has 4 chapters of “epic” levels that starts with three factions against cartoon pandas, and ends with three factions vs. zombies. In each chapter, you will play Pirates, Zombies, Pandas and finally Ninjas, with the other two factions providing special members with unique abilities. While the familiar Angry Birds gameplay mechanics is present, there are a few minor variations that make it more exciting. You will have friends trapped in the enemy hideaway, and you have to be careful not to kill them while destroying your enemies; else you will have to replay that level. When you attack, the screen zooms in to show the destruction your cannon has meted out to your enemies. The game has 45 levels, and every level gives you the opportunity to unlock achievements. As you progress through each level, scoring on every shot fired on innocent cartoon pandas or grotesque zombies, you will unlock special characters such as chopping ninja, a bomb dropping zombie and a panda that farts. The visuals are impressive, including the characters and the background. 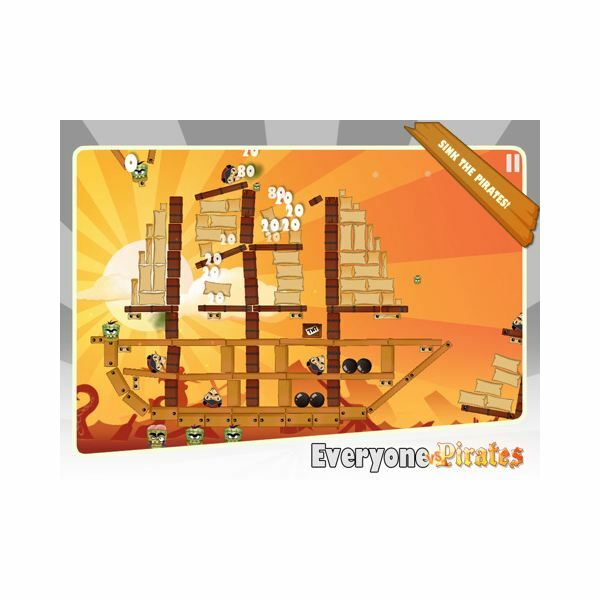 Overall, Pirates Vs Ninjas Vs Zombies Vs Pandas is a great game for those who are seriously in search for iPhone games like Angry Birds. Enough of wingless birds, crazy penguins and cutesy pandas, let’s play the Grim Reaper. That’s right folks, Death himself. Fun with Death boasts the same catapulting-objects-to-destroy-enemies type of gameplay, but here again it’s the unusual concept that makes gameplay more enjoyable and fun. You step into the shoes of Death whose sole responsibility is to eliminate bad souls and save good souls. So here you have two objectives to fulfill, catapult red devils to destroy evil souls, but make sure you don’t eliminate the benevolent souls on the way. The trebuchet here is the Grim Reaper’s scythe. You will have to carefully adjust the direction and speed of the scythe while slinging devils, but you must also be aware of traps along the way. As much as they help you trigger a chain of events that quickly destroys evil souls, they can destroy the good souls quickly. Although the game is an Angry Birds clone, the variety of challenging puzzles in every level makes it distinct from the original. To me it is one of the best games like Angry Birds, not only because of its unique concept, but also the complexity of the levels. This iPhone game is much like Crush the Castle – physics-based artillery game that inspired the developers of Angry Birds – but the controls are much easier than the original. 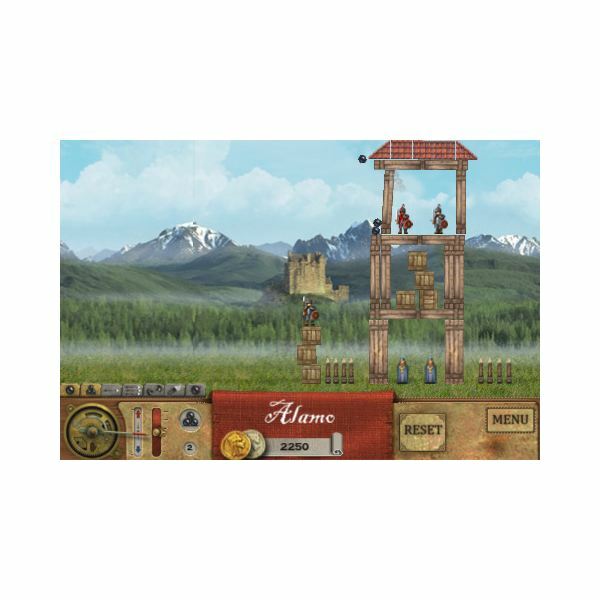 Instead of pulling back on a trebuchet to release cannon balls, the player has to adjust the speed and angle of the shot through the menu located at the bottom of the screen. This can be strategically more interesting and fun than launching objects by pulling a trebuchet or a slingshot. You can plan where to hit and, as you progress, the levels become more challenging, but they give you a chance to plan your attack and not aim blindly at the castle. Da Vinci Cannon can’t be called a complete Crush the Castle clone, and is quite a lovely game for those who are looking for Angry Birds and Crush the Castle alternatives. If you want more physics-based fun than just flinging chirpy birds to destroy the fragile castles of evil green pigs, play Fragger. This game lets you lob grenades at your enemies and requires a great deal of accuracy in doing so. You have a limited number of frags to lob and hence have to plan in advance before attacking your enemies. The puzzle element of Fragger is what makes this game a cut above other games like Angry Birds. The obstacles are carefully positioned, which requires you to plan your attack, adjust the angle of throw and set the right speed to ensure that the grenade lands near your enemies. Fragger for iPhone features 250 challenging levels. Unlike the PC version, which only lets you lob grenades at cartoon insurgents, the iPhone version lets you fling them at zombies and aliens. There are seven different worlds, each with a unique background and different types of enemies. The game lets you compare your score with the online leader board and constantly updates itself. With excellent visuals, controls and audio, Fragger is a nice little Angry Birds alternative and a must-have for all physics-based puzzle game fans. If you need help in completing Fragger, why not take a look at our Fragger walkthrough. While there are several games like Angry Birds for the iOS, only a few are as challenging and impressive as the original. Of these best Angry Birds alternatives, I recommend Fun with Death and Fragger, as both the games have puzzles that are more challenging than Angry Birds. Which game do you think is as good as Rovio’s iPhone gem? Do comment.